In my last post I noted that it's interesting how some models had very short production runs while others went unchanged for multiple years. Sometimes watches that were made for several years seemed to evolve over time. 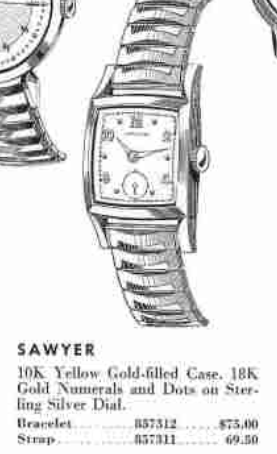 A good example of model evolution is the 1955 Sawyer. It was produced through 1964 - a long run matched by few other models. However, depending upon the year, it received several different bracelets that dramatically altered the look of the watch. By 1958, the only thing that changed on the model was the price. 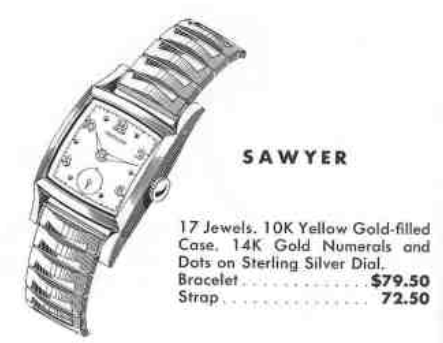 The 1959 model year introduced a combination leather and metal bracelet made by Kreisler. 1962 introduced another, similar design that I believe is different from the 1961 model - but I'm not 100% sure. One thing is for sure, the price of the model was decreased by $5.50 so something must have been changed. In the final year of production for the Sawyer, another bracelet was added - so that makes five different bracelet options for the model over 10 years. One thing consistent in the model is the 10K yellow gold filled case with silver butler finished dial. Tucked inside the case is a 17 jewel, 8/0 sized, American-made 730 movement, and possibly a 731 in the later models. The 730 is a shock jeweled version of the 747 that was introduced in 1947. The 731 changed the balance wheel design of the 730. 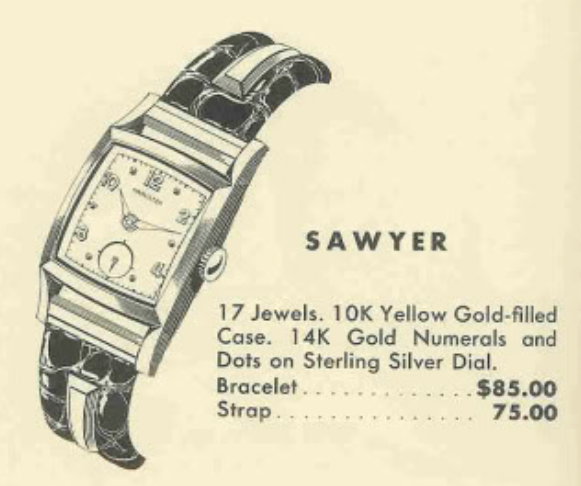 My project Sawyer watch came with it's original bracelet and using that I can date the model to the 1959 / 1960 period. Other than the crystal being a bit scratched up, the watch is in very nice condition. The case back is inscribed with a presentation from 1958. Hamilton's model years were a little like cars and new models were introduced before the end of the calendar year. 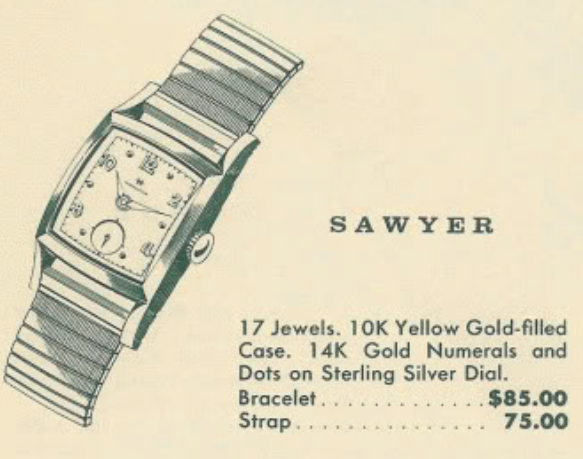 So this watch was probably a very early run of the 1959 design... or the bracelet was added later. There are no good ways to date the watch since the movement doesn't have a serial number. The 8/0 movements like the 747, 730 and 731 are probably the "easiest" movements to re-assemble. They can still have their issues - but getting them back together is a much simpler process than their 8/0 cousins, the 748, 735 and 736. Everything is cleaned and dried before being reassembled with fresh lubrication. The freshly cleaned movement is now bright and shiny and purring like a kitten. I had to clean and recline the hairspring multiple times before I could get the watch to run cleanly on my timer. I like to leave watches running a smidge fast after reassembling them, as I find they slow down slightly after settling in. The dial and hands go back into the case and this very original-looking Sawyer is ready for another 60 years of wrist time.